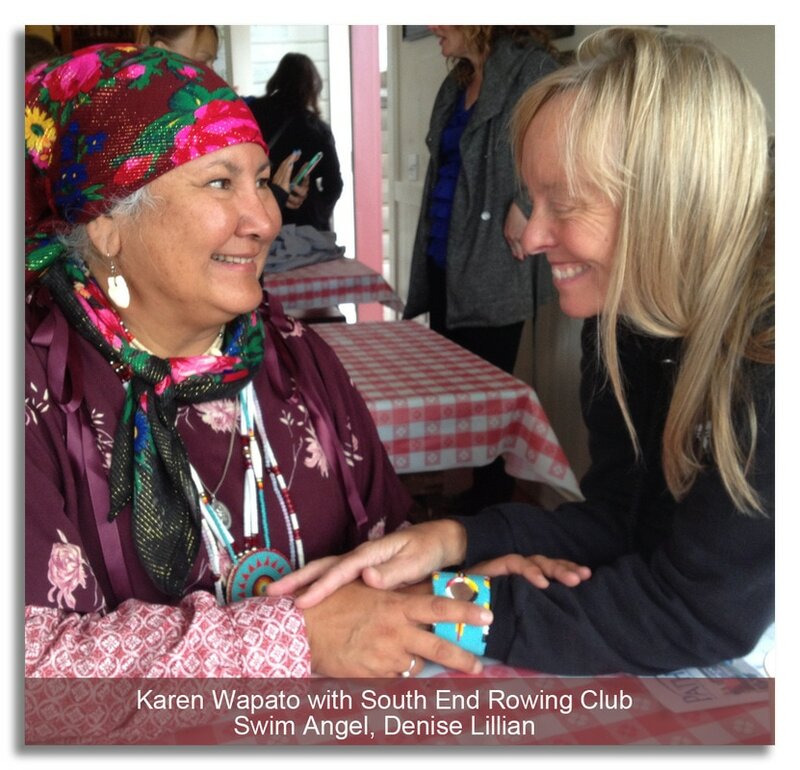 "We do this through our intensive week-long educational and experiential San Francisco-based Alcatraz swim program, through support and advocacy in overcoming geographic, economic, and political obstacles regarding food availability, eating habits, methods of food preparation, and lifestyle choices in Native American communities, and through programs leading to mentoring and role modeling that reinforce the benefits of meeting challenges and inspiring healthy change." 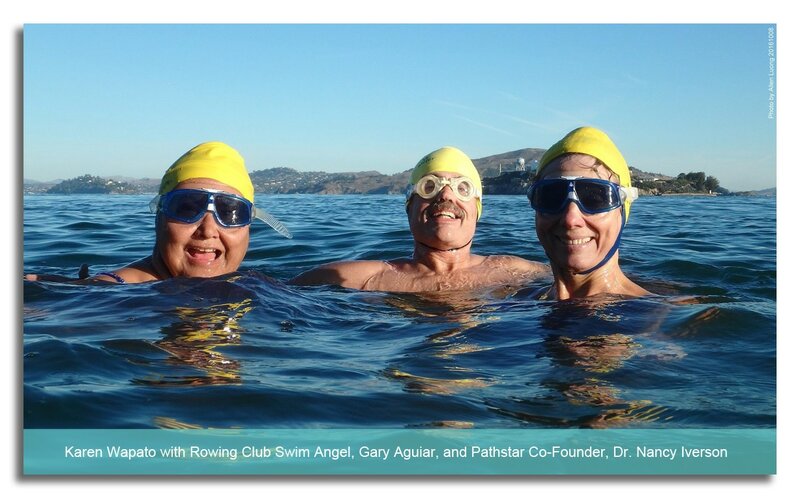 Though the Alcatraz swim is just one leg of the Pathstar health-reclaiming journey, it is the most dramatic. The mile and a half swim takes place in the San Francisco Bay with year round temperatures ranging from 50-60 degrees Fahrenheit. Too cold without a wetsuit for most people, but Pathstar participants seem to manage it—year after year. The Alcatraz swim has become world famous since the federal maximum security prison on Alcatraz Island closed in 1963, with competitive swims occurring throughout the year. It's a treacherous swim through brutal and unpredictably heavy currents. It is unusual for a swimmer to die, though not unheard of. One of this year’s Pathstar participants and community members was 58-year-old Karen Elizabeth Wapato, a registered nurse and member of the Colville Confederated Tribes, Nez Perce Band. “Recently, I had to walk into a situation where the reaction to me might be negative. I wasn't sure how I, a native elder woman, might be viewed. Would I be seen as inferior, would I be placated, would I be placed on a pedestal and the Indian-princess-grandmother story (myth), once again, be told?! How would I react—astonished Indian, indifferent Indian, angered Indian, or friendly Indian? I thought how often I'd been here. A place where all they know about you is nothing, and about your people, only the stereotypes (more myths). I thought, my mother often was in this situation; only then it was the 1950's, 60's, and 70's. My mom sewed her own clothes, but they were Vogue patterns, which she tailored to perfectly fit her size 4/6, 5'3" body. And how did I watch her present herself? With grace and self-respect. So I kept that in mind. Put my best foot forward. But I had more power than anyone in that room. Because only weeks earlier I had swam. I had made the hardest swim of my life. A swim I literally fought to complete. The waves had crashed against my body and into my face and down into my lungs. I thought about quitting because I couldn't catch my breath, no matter how hard I coughed out the salt water. My arms and legs were moving separately and I couldn't find a rhythm for my body and breathing to work together and carry me into the mouth of the opening. And, of course, right at that very moment, I thought of Mom. My little Mom. How strong she was. Sent at six years old to boarding school, she battled the nuns, but then TB took her. And then she had to live in a sanitarium, for years, and watch her older sister die in the next bed. And then, to regain her health enough to attend her senior year of high school. The rumor spread she was pregnant, but she was actually in the bathroom, hiding the fact she was still coughing up blood.She graduated high school in 1952. Then she graduated college, Western Washington University, in three years. Then she was a first grade teacher in Bothell. And then a wife, and my mom, and then mother of four children, she then graduated again, and was a nurse. And she was so fierce! We as little kids, stood behind her in a laundromat in Gallup, New Mexico. She stood her ground; even outnumbered by Navajo women, yelling in a language we didn't understand. But the gist was they would have to go through her. It may only be our clothes in a washer, but she would not back down. Or how she marched us away from a fruit stand, putting down the fruit she was going to buy, because the farmer was saying bad things about Indians. She never quit, nor would I. The thought of the drive she had has fueled me my whole life. I couldn't give up. I finished the swim. And I walked into that room, not only with the power of my swim I had just completed, but with all the power my mother gave me. She who made me take swimming lessons. She, who raised me, and she, who gave to me, the power of our ancestors. For more information on Pathstar, click here.